Q. Leaders mostly understand the benefit of engagement and often see OpEx as a way to obtain this, yet it seems that leaders are not well equipped to make this happen. In fact, the training for leaders is often ineffective. How do we overcome this gap? Img 1 – The relative effectiveness of OpEx and Engagement Training at different levels of the organization. It’s notable that training is deemed most effective at the lowest levels of the organization while executive level training is deemed effective only about 50% of the time. We can all see the connection between better engagement scores and improved performance, however there is a lot of confusion about what good engagement looks like. Often engagement is thought to be more frequent face time between bosses and subordinates, 360 feedback, suggestion programs, and so on. Rather, good engagement is about giving people the ability to directly influence their work. It recognizes basic human needs that include the power to make decisions, the ability to control outcomes and being part of something bigger. These attributes are not naturally occurring in many work environments so equipping leaders to enable OpEx is about training and coaching them on the essential actions and behaviors they must take to engage and align the organization from top to bottom. Tools and methods are covered, but gaining expert capability on them is not specifically intended. Rather, this portion of the workshop is meant to provide context for how front line practitioners apply problem-solving tools to achieve desired business outcomes. Our primary objective with leaders and managers is to provide insights that help them define and develop their own leader standard work. This means doing the hard work of changing some of their own behaviors and habits to be able to actively coach and demonstrate support for Lean to the organization as implementation begins. Beyond training and workshops, coaching is an important element that we always employ during project work with clients. Coaching is about observing behaviors and suggesting alternatives that can be more effective at delivering certain results. A simple example: If you want people to be more engaged, ask leading questions as opposed to prescribing a potentially ill-conceived solution. In this way, everyone learns something and engagement is supported instead of stifled. Q. If the leaders are not equipped to lead engagement, can implementation still be successful if delegated to a lower level? A. No. We’re talking about a shift here that must be valued up and down the organization and especially at the top. These values drive subtle and not so subtle behaviors that become part of the culture and transcend market shifts and personnel changes. Here we assume “implementation” to be a sustainable OpEx system. A leader who is equipped to lead engagement not only understands the benefits, but values the operating norms that better engagement brings. Since a lot of the heavy lifting and day-to-day activities of implementation are in fact delegated, it’s important to understand how to help leaders do this. We talked about the training and coaching aspect for leaders in Q1 above. In addition to understanding the value of better engagement, the organization must know how to do it. Everyone in the organization must be expected to spend a small percentage of time on improving the business ― as opposed to running the business. In the simplest terms, this means allowing workers some freedom to fix problems that affect their day-to-day work at the micro-process level. Supervisors and middle managers aren’t exempt: They too should spend about an hour a week addressing slightly more “macro” problems that affect their areas and people. At all levels, the most effective improvement efforts are team-based to drive process ownership and accountability. Since exactly how to do engagement can be described, the activities can be tracked. This is important because it moves leaders beyond the idea of just “valuing engagement” (because who doesn’t right?) to “knowing how to DO engagement.” Only when this happens can implementation be effectively delegated. Q. How important are engagement scores to measuring the success of OpEx? What measures would be more important to determining success? A. Engagement scores are important. OpEx and engagement scores (from surveys and audits) are directly related. Successful Operational Excellence is in large part the result of good engagement. So engagement scores are a good lagging indicator of OpEx and a great leading indicator of operational performance. Leading indicators ― Instead of a “result” metric, leading indicators are often the measurable actions that are taken to achieve a result. 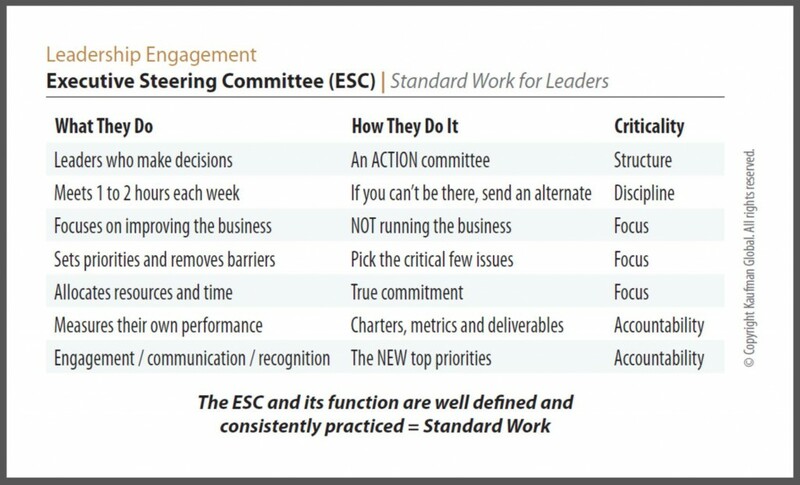 For engagement these are the structures and mechanisms we use to cause engagement – for example, the Executive Steering Committee (ESC), Functional Steering Committee (FSC), and Lean Daily Management System®. These structures describe specific, measurable activities that are part of a high-functioning OpEx system. Middle indicators are the process performance measures ― and the associated plans to improve ― at the macro and micro-process levels. These are a tangible reflection of the living adoption of OpEx. The organization likes these a lot because they show something is being done to improve results. Engagement scores are an important lagging indicator that provides proof and external validation that the OpEx system is working (or not). Those who score the highest go beyond better communication and asking people for more feedback. They incorporate ways for employees to have direct input into the work that they do – that is, the work that is relevant for them. Want more detail on these topics? You can download the full survey report – An Examination of Operational Excellence – from the Resources section of our website. (It’s great, really). To learn more about enabling leadership to connect the dots between engagement and value, check out our White Paper: Engage the Organization – And a Performance Culture Will Follow. Transformation requires a fundamental shift in how the organizations collaborate to make real change happen. When it comes to guiding an organization through transformative change, control is the determining factor. How much design and direction is pushed down from the top and how much discretion is left to the rest of the organization will make or break any initiative. The best outcomes are achieved by striking the right balance between two approaches: Top-down command and control versus autonomous decision making. Moving the organization off their status quo means certain things must be directed and enforced, yet many organizations fail because so much of their energy is focused on controlling the wrong things. 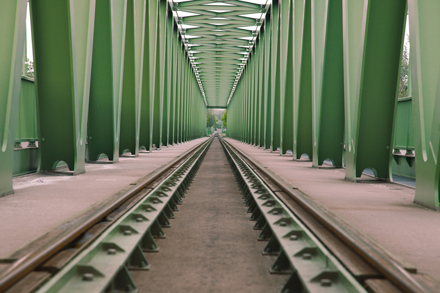 Successful transformation efforts demand collaboration up, down and across the enterprise. For process optimization to occur, the organization must establish ways for people doing their work to be continuously involved. Significant changes (processes, procedures, work standards, etc.) they must be developed collaboratively. If new methods and approaches for process, communication, safety and efficiency are foisted onto the organization, resistance mounts and the game is over before it’s even started. Autonomy and recognition are at the top of every single study ever conducted about what motivates people in their work. Without these elements, engagement dies and performance suffers. Self-regulating systems provide these attributes naturally. People know more about what is going on in their process or work area than anyone else. It is impossible to optimize any process without direct input and frequent feedback from those doing the work. People will not naturally form themselves into a structure of engagement that focuses on process efficiency. Instead, they will form personal networks that minimize conflict. Correcting this tendency is where leadership focus is critical in helping to drive process ownership and improvement through cross-functional teams. The culture of the organization and individual leadership styles will impact how transformation efforts go. It’s usually difficult to tease one out from the other since they are the product of their collective and often mutual experiences. Even so, it is a mistake to use culture as an excuse for poor progress. There are ways for leaders to adjust their approach within the context of the existing culture. In top-down environments, unless there are real changes in the fundamentals of collaboration, it soon becomes evident that the “transformed” enterprise looks and operates as it always has. These systems integrate those doing the work in the design of the process and ask what needs to be done to optimize performance. These systems are less bureaucratic and faster to react. Those who embrace and perpetuate authoritative command and control systems believe that top down management knows more about how work should be done than those closest to the work. These “managers” hold power dearly and resist engagement for fear of losing power and control. Authoritarian organizations are less efficient and less effective than those where a certain and significant control is pushed down into the organization. When this happens, reaction times in the dynamic environment speed up and safety and efficiency improves because decisions can be made faster. Standardizing and enforcing how the organization engages as a self-regulating system yields the greatest long-term benefit. Unfortunately those managers who survive in top-down systems are the usually the last ones willing to give up “their” control. Command and control styles dominate because they are more traditional and more familiar. 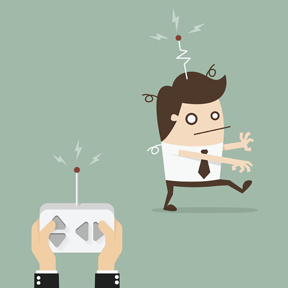 For bosses and managers, giving up control is tough, especially when under stress. Self-regulating systems don’t require any less work, but in them the direction from the top shifts. They require people to own their performance and enforce the best framework to make this happen. For those control freaks out there who must control something, fear not ― moving into a more autonomous environment requires plenty of leadership and direction. No organization comes together one day and says, “Hey, let’s all take some control and regulate ourselves and own our performance!” Getting to this place requires a transition of power that requires a lot of work for both traditional leaders and their organizations who are used to being told exactly what to do. People are smart though, and they will find the best ways to optimize processes, enable standards and share learnings if they are given the chance and a mandate. Start by describing a structure that accelerates engagement, collaboration and autonomy and then make sure people are fully subscribed. Clients never say: “We want to transform and do better, but we don’t care if we sustain the improvements.” Clients always profess a sincere desire to sustain results. This intent is so pervasive that during the past 20 years we’ve seen the rise of Operational Excellence as a legitimate function across wide swaths of business and industry. Yet most organizations fail to realize this apparently lofty goal. Low levels of lasting success are usually explained at a tactical level, but the reasons that leaders and their organizations get it wrong goes much deeper. It’s obvious to say, but our environment is dynamic. Everything changes all the time. 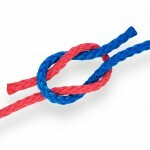 “Sustain” conveys a sense of holding something – a process or procedures for example – in place. It’s time to re-evaluate this concept and acknowledge that in a dynamic environment, sustain doesn’t mean we pin something to the ground. Rather, it means we stay in lock-step with a moving target, consistently and credibly adjusting and improving. Value is best understood where it is created. People know the most about optimization of the things they work on. Even more important, people care more about the things they work on than the things they don’t. Failure to grasp this rule is why top-down control of improvement systems doesn’t work well and never lasts. A primary (perhaps the primary) function of leadership is to compel engagement. Easier said than done, we can state flatly that engagement is an activity that can be measured and when it’s missing, overtly addressed. Experience tells us that if engagement is not compelled, it will not happen enough to deliver lasting improvement. When everyone works on solutions with cadence, structure and discipline, peers are required to spend time together improving their deliverables along the value stream. Team dynamics increase accountability and generate performance momentum. This is the catalyst for sustainment. The building blocks of lasting transformation revolve around getting and keeping everyone engaged (Rule #3). Unfortunately, organizational dynamics and behaviors that deliver this are seldom experienced or even witnessed. And, “What good looks like…” is rarely part of one’s education or training curriculum. Understanding the structure of engagement so that it can be baked into the DNA of the system is essential to going beyond the “what” of transformation and getting to the “how” of it. The organization is engaged when you, your peers, your superiors and subordinates spend at least one hour each week actively improving the business. This is what good looks like. When you overtly define engagement at an individual level, the behaviors and actions of it can be observed, measured and mirrored. Too often, leaders want everyone to really “get it” before they do it. Transformation happens in the reverse. Transformation initiatives most often occur inside a business emergency. During these times, communication spikes, teams are formed, actions are chartered and things get done. It feels great! When it’s over, the quorum disengages, momentum wanes and everyone reverts to business as usual. The final step is recognition and reward conveyed for fixing the crisis. Big changes, big projects, and big results – these are the things that get noticed and rewarded. Everyone working on small, incremental changes and improvements for the better? … Yawn. When the requirements for sustainment are poorly defined, not well understood and appear difficult to measure, they are avoided. Success requires broad participation, openness to new ideas and a convergence of standard, simple mechanisms aimed at improving the business. Overtly make the connection between transformation and sustainment, then weave it into the compensation, reward and recognition system. Make it safe and make it pay. The concepts and execution requirements described here are so simple that they are easily dismissed. The ideas of broad inclusion and a flatter organization often require a significant re-evaluation of organizational norms and are naturally avoided. Any distraction; the latest crisis, a new technology or any approach or method that might require less coaching and change management is a welcomed relief. Without some overt activities that demonstrate our adherence to engagement, most will shift away – usually with the tacit approval of their bosses who never got it in the first place. When engagement and sustainable transformation starts to occur, decisions are pushed down in order to optimize absolute value. This is a shift that challenges well-established networks that are built around personal relationships and existing dynamics. It’s disruptive. This above all others is the biggest reason for failure. The truth is this shift frees energy that is traditionally spent on re-work, redundancy and errors. Not everyone will see it this way but when the new system of engagement is well defined and well structured, resistance is easily surfaced. Shifts in organizational and personal behavior are required. Recognize the fact that something that threatens entrenched relationships and systems succeeds only with a crystal-clear mandate, a well-defined plan and adequate coaching. 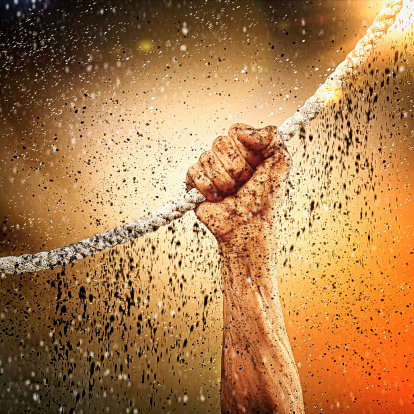 With all these obstacles, it’s no wonder the majority of organizations and leaders lament an inability to sustain their transformation and continuously improve. Start by viewing the system holistically with a keen eye on organizational dynamics, individual behaviors, simple definitions and an approach that is firmly linked to activity-based performance measures. This will help avoid rework that is exponentially more difficult the second, third, and fourth time through. For information about how to engage workgroups and push decision making down, read about Kaufman Global’s Lean Daily Management System. Top leaders frequently approach us seeking solutions to their business problems. They want to know what approach we will use, what tools will be applied, how the project will be managed, what results to expect and how we will get their organization to change and sustain? 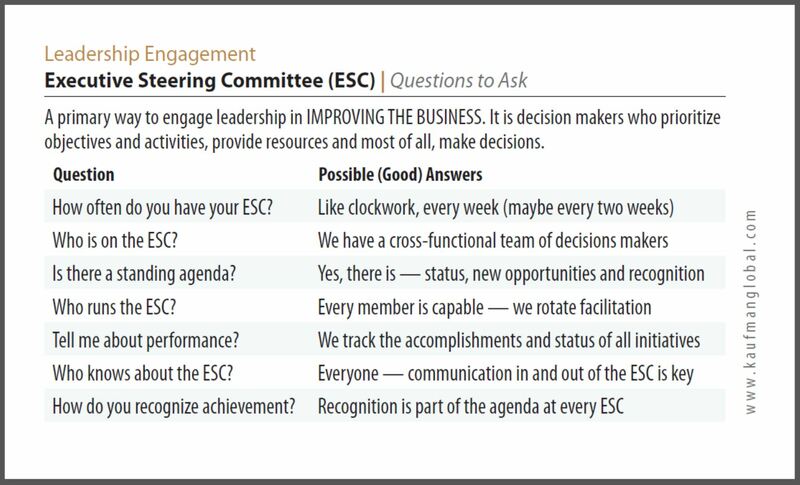 A high-functioning Executive Steering Committee is the most powerful technique for effective change. These are good questions, yet, their focus is entirely on the problem and the organization. It omits the critical success factor – namely, their own role in driving change. Seeking the answer to that question means there is recognition that standard work isn’t just for “the doers”. Having a disciplined approach to leading and managing change at the top of the organization is the difference between success and failure. It’s what brings focus and alignment, and therefore prioritization and attention, to the urgent things that must be done. What more could you be doing to propel your teams and initiatives forward with a standard work structure for leaders that drives focus and discipline? Do an informal audit of your own to identify areas of improvement. Change is inevitable. Whether you’re leading it, supporting it, or it feels like it’s being forced upon you, uncertainty can make change a painful process. A new reporting structure, the arrival or departure of an employee, or a company acquisition can make you feel like your world is turned upside down ― but only if you let it. The challenge lies in being able to more easily (and gracefully) consider, accept and adapt with the changes that occur. A part of you must become immune to the fear that stems from the unknown or unfamiliar. Ultimately, you have to learn to take an active role in the parts you can influence or control. When this happens, you might even become an advocate. As seen in the reality show competition Survivor®, where the rules (i.e., Outwit, Outplay, Outlast) are straight forward, there are countless opportunities to be blind-sided by change. In Survivor, the most successful participants are not only more in sync with their surroundings, they also possess the ability to think on their feet and lead. When opportunities arise winners quickly adapt to them, even when the change is put in motion by others. There’s a constant give and take that transpires ― lead, then follow, lead, then follow. Mutual respect is key. 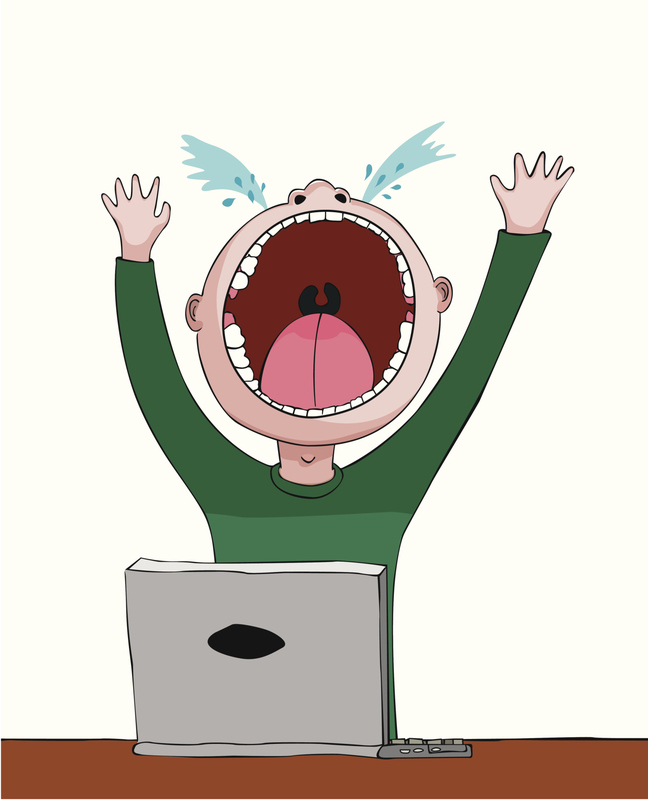 While some people can more easily navigate different levels of authority and structure, others kick and scream through it. On Survivor, they’re typically the ones voted out first. So, when confronted with change and uncertainty in the workplace, how do you more effectively adapt, survive, or even thrive? Beyond reading Dr. Spencer Johnson’s classic Who Moved My Cheese?, consider a few of these ideas to make the transition easier. Lack of communication can have negative impacts, while effective communications usually aid the change process. Don’t sit back and wait for things to happen― if possible, talk to the person presenting the change. Not only will you get some of your questions answered, you may be providing that individual with insight about what kinds of additional information the organization views as lacking. However, beware of “updates” that come through informal channels like the break room and shop talk chatter, as news that travels that way is often distorted. Change requires flexibility. The better you are at adapting to change, the greater your chances are of being successful. It can be easy to get wrapped up in the gritty details, without ever thinking much about why the change is happening in the first place. Take a good look at the new situation and instead of focusing only on what will be different, look ahead and consider the destination that you can be part of. In planning for the future, organizations often conduct an analysis for strengths, weaknesses, opportunities, and threats (SWOT). That type of SWOT analysis can be just as helpful to you individually. What skills and strengths do you have? Where do you need to improve? 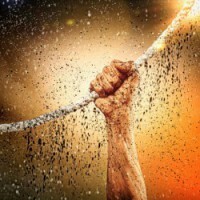 By understanding your own strengths and weaknesses, and educating yourself on the new situation, you can proactively look for opportunities to take on new responsibilities and challenges. Negative thoughts block your creativity and problem-solving abilities. Positive thoughts build bridges to the new reality. Look at change as an opportunity and strive to find the benefit within it. As you do this, an attitude of anticipation will grow as you evaluate the potential of what could be. As you journey through life and experience new situations, you’re bound to make mistakes — that’s human! The important thing is to take a lesson from each of those situations and apply the learning. Not only does this better prepare you for future periods of uncertainty, you can impart that knowledge to others and help them manage experiences that are new to them. In the end, change can be disruptive. But, with the right attitude and actions, you can become a change advocate finding creative ways to participate and affect a more positive outcome. After all, you’re a survivor right? The following is an excerpt from Kaufman Global’s White Paper: Engage the Organization and a Performance Culture Will Follow. Here we examine the reasons why leaders fail to pursue employee engagement, even while it’s proven to be fundamental to success. If we accept the idea that a fully engaged organization is fundamental to success, then we must ask, “Why Do Leaders Fail to Act?” The simple answer may be because it is exceedingly difficult to challenge ingrained culture and belief systems. Pushing decisions down, engaging the organization broadly and deeply, and giving up some amount of control is not a simple matter. In fact, it counters the culture of traditionally run organizations. To dig a little deeper into the reasons leaders fail to pursue engagement, Kaufman Global recently surveyed a large group of top leaders and known change agents. These individuals come from diverse industry backgrounds, such as consumer products, energy, government and technology. Averaging over 20 years of experience, each has a proven track record of successfully engaging and improving their organizations. The question was asked, “If we accept that the leader’s function is to create value and that one vital and comprehensive way to do this is by fully engaging the organization — at all levels and at all times — why do so few leaders truly, actively pursue this essential aspect of sustainability and performance?” Six possible answers were given with a rating that ranged from 1 (seldom) to 5 (often). A summary of the results follow. Additional detail is provided within the white paper. Distraction | The top reason at 80% is that leaders are too distracted with day-to-day operations and other external inputs to focus themselves or their teams on anything other than existing systems applied to here-and-now deliverables. This defines a mostly reactive environment and one that has multiple competing inputs — often from above. It’s true enough that “Change starts at the top.” With enough distraction the opposite is just as true (and way more common). In this instance, engaging the organization is not valued enough to make it a formal priority. Immediacy | Next comes immediacy at 72%. Immediacy has to do with the extreme focus on short-term goals and results. There’s no time for something that might not deliver a here-and-now win, requires some level of faith and is even slightly different than anything already being done. Moving upward in the organization, if results are not achieved, personal compensation and job security are at risk. Immediacy and distraction are intimately linked. Distractions mount as the need for immediate results rises. Two back-to-back quarters of poor performance and the level of distraction goes off the scale. If this cycle goes on long enough, pressure and confusion over priorities lead to loss of morale and disengagement. People tend to exit these types of environments, and it’s unfortunate that engagement — a major mitigation factor and the single greatest contributor to employee morale and retention — is among the first to go and is seldom pursued in a systematic fashion. Tools | Following closely at 68% is “toolitis.” This is a common ailment of many organizations where things like Kaizen Events, Value Stream Mapping and 5S are viewed as engaging the organization. It’s true that these types of activities get people involved, but only temporarily. Six Sigma is more of an expert practitioner methodology and has even less of an engagement mandate. There are many examples of organizations stalling in their Continuous Improvement efforts when they apply a tools-only approach. They have the tools, but value workers are not compelled to pick them up and use them because they aren’t immediately aware of, or have visibility to, their own performance. “Toolitis” is a big problem within production organizations, where employees find it difficult to expand into business processes because they can’t translate the improvement techniques they started with. Tools are most effective when they held in place with engagement. All of these factors are closely related and combine to form a powerful barrier to real change. That “fail to understand” and “don’t believe” were scored as significant factors says a lot ― and not in a good way ― about basic leadership and management skills. Training is one element that can help, but people learn through their own experiences that are illuminated by existing values and norms. To change these patterns requires a significant reset on how organizations reward certain behaviors. These barriers — and they apply at all levels — are daunting for anyone attempting change within the area they control. Some traps are more common depending on where you are in the organization. The lower you go, the more the system will attempt to kill your initiative (i.e., “Not invented here.”, “Who else knows about this?” or “This is not part of your job description.”). As you go higher in the organization, the problems associated with trying anything different prevent ignition ― pick any combination of reasons. Those in the middle of the organization have simultaneously the most to gain and the most to lose. Here there is a lot of local control over value creation ― therefore the gains can be fast and big. In addition, the personal risk of failure for trying something different is less; yet there is strong attachment to the status quo and disruption isn’t much welcomed. Besides, in many situations, operating marginally better than one’s peers doesn’t require anything as foreign as attempting your own fully engaged organization. Without the support of peers and bosses, mid-level managers quickly start to feel they are rowing upstream alone. Ready to dig deeper? This article is continued in our White Paper: Engage the Organization and a Performance Culture Will Follow Click here to download the full text. 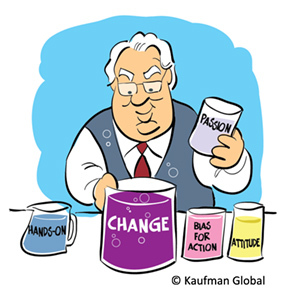 Drop us a line if you want to learn more about Kaufman Global’s view on engagement. In life, there are those who watch things happen, and those who step up, take action, and make them happen. This concept is woven into the fabric of today’s aggressive and diverse economic landscape where organizations seldom stumble upon success by simply having a strong product or service offering. On the contrary, attaining business differentiation — and sustaining a level of success — requires assertive action – that is; a strong and enduring bias for action. Leading organizations do not sit back and hope for better results. They are far too busy creating them. Over time, whether we admit it to ourselves or not, each of us have fallen victim to envy. Being human, we simply cannot help ourselves. When we see others win the lottery, get a promotion, or take an extravagant trip, there’s a small part of us that asks, “Why not me?” We wonder why and how others are achieving such great things. Ironically, in most of these situations, we never bought a lottery ticket, didn’t take the time to apply for the job, and / or spent our vacation money on a home renovation project. Yes, we have high aspirations, but we often make no real commitment — or exert any true energy — to reaching them. This type of behavior is commonplace in the business community. Leaders often gain a better understanding of their own organization’s challenges by focusing on (envying) their competitors’ successes. For example, upon hearing how another organization realized millions of dollars in cost savings or has been recognized as one of the “best places to work” as a result of Lean transformation efforts, many leaders do little more than share the story with their team and ask “Why not me (us)?” Even though there are countless business cases supporting waste elimination initiatives, few dedicate sufficient time and resources to effectively implement improvements. For those that do, many struggle to commit to long-term change and, therefore, find themselves circling back to the same question. A hospital had been experiencing a high degree of front line employee turnover for several years. Recent metrics revealed that 47% of its new hires left in the first 12 months and 74% in the first 18 months. To address this significant challenge, a disciplined, comprehensive project was organized to drive improvements that would increase employee involvement and reduce ongoing organization stressors fueling high turnover. Partnering with Kaufman Global, problems were measurably targeted and new methods and systems were introduced to address issues through Lean Leadership® learning, Rapid Performance Evaluation (RPE), and The Lean Daily Management System ® (LDMS) implementation. Employee ideas are now constructively integrated into the daily work. After only one and a half months on the project, employee flight stopped its free-fall and signs are good for a sustainable reverse of fortune. Employees can now be heard saying, “this is our chance to make a difference. ” Related article: Employee Retention: Strategy and Tactics. A global tire manufacturer needed to reduce rework and improve machine stability as a foundation for the implementation of a pull scheduling system. Kaufman Global provided oversight of the strategy, design and sequencing of the project through the development and launch of a multi-phased approach. Phase 1 consisted of establishing cross-functional teams to enhance processes for improving changeover times and overall equipment effectiveness (OEE). Phase 2 involved the pull system development and associated pre-implementation work. To drive sustainable change, workgroups and task forces were mentored, trained, and engaged by working side-by-side with Kaufman Global to actively apply Lean principles to their operations. Upon completion, a successful demand-pull inventory management and scheduling system was developed to right-size inventory, enabling $750K in annualized savings. Cycle time was also reduced by 17%, resulting in an increased capacity of 274 tires per day. One of the largest mini-mill steel makers in North America needed to improve productivity on direct labor by redeploying manpower, reducing overtime, and increasing utilization. With a focus on enhancing operational and functional performance, the client needed to develop internal Lean experts to drive improvements and compel a company-wide customer-focused culture. Over a two-year period, Kaufman Global led analysis, program design, implementation and internal capability development efforts. Plant throughput was optimized by expanding OEE, equipment reliability, product yield, and changeover time work streams. A production planning system was also developed to increase responsiveness to customer demand. As a result, the client achieved capacity increases through a 43% reduction in changeover time, enabling $1.1M in additional revenue. Raw material inventory was reduced by over 50%, driving savings of $25K per month. They also recovered 415 man hours, saved 334 miles of walking and resolved four ergonomic issues. Success stories like these are abundant for those organizations who fully commit to establishing a Lean culture. Want to find out more about how Kaufman Global works with clients around the world to improve and sustain their results, contact us here. The following is an excerpt from Kaufman Global’s latest White Paper: Engage the Organization and a Performance Culture Will Follow. This paper examines the reasons why leaders fail to pursue engagement, even while it’s proven to be fundamental to value creation. Content stems from research completed with top leaders and known change agents with diverse industry backgrounds. Engagement is about working together, being involved, two-way communication and, most of all, the ability to have input, make decisions, and take action on those things within one’s immediate control. This level of involvement surely generates value. However, value can be a complex topic. If you doubt this, read a little about prospect theory, loss aversion and anchoring. Here, we are talking about the benefits that are derived from efficient and effective processes. me looking for my missing wrench?” No. us counting excessive inventory?” No. our inability to find or retain the best talent for this job?” No. accidents that result from an unsafe work environment?” No. The individual or team touching the product, service or process creates value, and the customer judges it. However boundaries can’t go completely undefined and left to personal whims. In day-to-day work, value is bounded in absolute terms like quality, quantity, time, etc. These definitions are turned into metrics and spread across the enterprise, but usually at levels too high to effectively measure individual or workgroup performance. Only through engaging the organization at this level ― those doing the job — can we react to the dynamic environment, make real-time adjustments and capture the value that is otherwise lost. Manufacturing | The assembly line worker knows the most about how to reduce the amount of movement required for the job. The maintenance technician and equipment operator are best able to increase Overall Equipment Effectiveness (OEE) and reduce Mean Time To Repair (MTTR). The Plant Manager optimizes factory output by engaging the functions and taking decisive action. Psychiatric Hospitals | The direct care worker may recognize patient behavioral triggers sooner than their physicians due to daily interaction and familiarity. The unit treatment team is best equipped to improve a patient’s mental health by making necessary changes to the treatment plan. The Hospital Administrator balances the needs of the patients, nursing staff and doctors and sets priorities. Oilfields | The maintenance technician controls cost by managing the proper inventory of materials to complete a job. The operations manager knows the most about balancing customer priorities for field technical equipment. The oilfield operator knows which component suppliers contribute to the best rig operating conditions or uptime. If leaders want better results they must embrace pushing decisions and the ability to make change happen down into the organization where value workers engage. Download and read the entire White Paper here: Engage the Organization and a Performance Culture Will Follow. Bacon Revolution: Are You In? 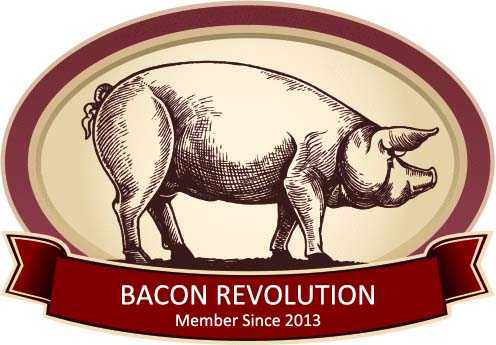 I’m not sure if you’ve noticed, but there’s a bacon revolution going on. Everyone seems to be talking about bacon and eating more of it lately. Recipes are sweeping the Internet. Fast-food chains are peddling double bacon burgers, and upscale restaurants are wrapping steaks in it. Some connoisseurs are even adding it to desserts. To top it off, retailers are carrying all types of themed products, ranging from bacon soap, salt water taffy, to soda. It’s everywhere you turn. Until recently, the frenzy had me puzzled. In today’s health conscious age, this new obsession didn’t add up. After all, 68% of bacon’s calories come from fat, almost half of which is saturated. According to the American Heart Association (AHA), foods rich in saturated fats can raise cholesterol levels, increasing risk of heart disease and stroke. So, having witnessed bacon’s rise in popularity over several consecutive months, I couldn’t help but ask myself: Why such a pig…I mean “big”… push for a food that we’ve all come to recognize as being so unhealthy? Is there a new, fat free form on the market? Have experts made a discovery that bacon is actually good for the body? Upon doing some research, there were no ground-breaking “bacon discoveries” to be found. However, I did learn about some healthier ways to prepare and eat it. Reading the countless available articles, I had a sudden epiphany. It hit me that the meticulous handling of bacon provides a valuable lesson. There’s a right and wrong way to do things, and, in many cases, the right way is neither the easier nor the faster path (but it’s still “the right path”). Suddenly, I felt inspired by bacon. To me, bacon provided an ideal metaphor for how a business should manage its operations. Much like there’s a right way to consume bacon in order to maintain a long, healthy life, there’s a right way for businesses to manage and improve operations to drive lasting value. Going about it the wrong way… well, there are consequences. To lower intake of the saturated, fattiness of pork belly, consumers should consider baking it, rather than frying. For optimal results, it should be placed on a rack, which allows the grease to drip down into a pan underneath — keeping it from getting reabsorbed. This makes for less greasy, crispier, and, ultimately, healthier bacon. Much like bacon preparation, businesses that effectively apply Lean methods can remove waste (the fat) from their operations. Waste can be defined as anything that uses resources but does not add real value to transforming a product or service. According to Taiichi Ohno, the father of waste elimination in manufacturing operations, there are seven unique types of waste. Once waste is removed, the improved processes require less human effort, capital investment, floor space, materials, and time in all aspects of operations. When eating bacon, servings should be kept small and include antioxidant-rich fruits or vegetables to create a more well-balanced meal. To effectively sustain improved operations, Daily Workgroup Meetings should be held to monitor progress. Lasting no more than 10 minutes, these tightly facilitated, loosely scripted, daily stand-up meetings (a) bring everyone together as a team; (b) provide every person with the same picture of what is going on; (c) focus each person on the metrics and key performance indicators that they can control; and (d) generate a sense of ownership among the team about their area and processes. Regular bacon eaters should strive to minimize intake of other processed meats to keep their total consumption of processed meat to a minimum. So, with these ideas in mind, I’ve officially joined the bacon revolution. Now, I’m more focused than ever on driving sustainable change. How about you? Are you in? https://www.kaufmanglobal.com/wp-content/uploads/2017/06/blockblue2.jpg 832 800 Kaufman Global https://www.kaufmanglobal.com/wp-content/uploads/2017/05/kaufman_global_logo-1-1-1.png Kaufman Global2013-01-31 09:08:592017-09-06 08:40:26Bacon Revolution: Are You In? In my role as a management consultant at Kaufman Global, I work within a variety of industries ― both the public and private sectors ― assisting clients with driving sustainable change across their enterprise. In partnership, we work to reduce costs, improve the quality of their products and services, and identify new opportunities within their markets ― all while increasing productivity. During these engagements, I am always asked the same question, “What is the biggest contributing factor to a successful Lean implementation or cultural transformation?” My answer is always the same: A committed leader. The term “leadership” can be defined in a lot of different ways, but essentially leadership occurs from one’s ability to guide, direct, or influence people. Within any culture change, Leadership’s role is to create a vision that their employees can believe in, and ultimately foster their desire to achieve it. In other words, human beings want someone who inspires them to be the best they can be. Leaders need to spend time out of their offices. They need to work alongside their staff to appease their anxieties and solicit their input for improvements. Taking these ideas and transferring them across the company is the key. By listening to these ideas, a leader can establish relationships based on confidence and trust. He or she becomes a trusted advisor, demonstrating that continuous improvement is not only desired but adopted by leadership. Strong leaders have a continual desire (passion) for making a difference in peoples’ lives by consistently enabling and empowering them to be successful. Many employees don’t care until they see that their leadership does. When implementing a Lean culture, resistance to change is often present early on, but people don’t mind being asked to do something different if they see that the leader truly cares about their future. In fact, when a committed leader makes decisions, he or she does so with the organization’s success in mind. People want to be inspired to achieve their best and become what they know they can be. Leadership is about attitude. Leadership is about walking the walk. It is much easier to demonstrate the vision than to explain it in words. People watch a leader’s feet more than they listen to their words. A strong leader inspires hope, develops trust, earns respect, and provides encouragement ― all by treating others with respect and conveying a positive attitude. Recently, I had the pleasure of working with a top leader that exhibited all of these qualities, resulting in one of the best client engagements that I have ever been a part of. After being newly hired, this leader came in and observed the existing work environment and the interaction of his senior leadership. Instantly, he recognized that the team was too large to be effective. There was little accountability, and decisions were rarely ― if ever ― made during meetings. As a result, he quickly reconfigured the team and set very clear expectations of how the team would perform moving forward. Just weeks later, he came to the realization that the right people were not sitting at the leadership table, as one of this leader’s key strengths was ― and still is ― recognizing others who possess leadership qualities and promoting them accordingly. He understood that getting the right people, in the right place, at the right time was critical. To cut to the chase, the way this leader bridged the gap that existed between management and staff looked rather effortless. He drove changes by making himself available, listening to employees, showing respect to customers and staff, creating a bias for action, not being satisfied with the status quo, and inspiring the masses. In the end, others were willing to learn because he demonstrated how important it was to change. He walked the walk, maintained a positive attitude and demonstrated the organization’s vision repeatedly. Through his valiant efforts, I watched as the organization soared to new heights. At the end of the day, a committed leader bets on his people being able to achieve their goals. He or she ensures that the right people are in place and removes any barriers in their way. In fact, at the start of the journey, getting the right people in the right jobs is a lot more important than developing a strategy. The best leaders are not those that develop more followers, but those that develop more leaders. Learn more about how best to nurture Lean leadership, read our Developing Operational Excellence Leaders White Paper.